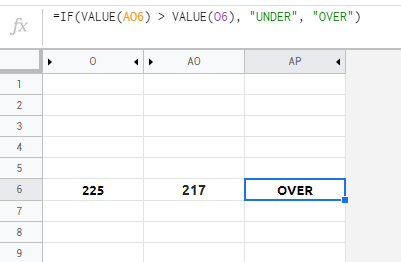 So I'm using Google Sheets and I'm trying to determine whether or not cells in a certain column AO have a higher value then cells in another column O. My formula is =IF(AO6 > O6,"UNDER","OVER"). The value in AO6 is 217 and the value in O6 is 225. However, the cell keeps saying UNDER when it should be saying OVER. 217 is not greater than 225??? Am I missing something?? ?